For those of you who follow me on snapchat, you'll have seen that I teamed up with OneforAll to treat my Mammy dearest to a lovely day out. I know sometimes we take our Mams for granted but I don't think there is anyone out there quiet like our Mams, they would do anything for us and are always there with the best advice and always have an ear to listen and a shoulder to cry on. My Mam is my best friend and I wanted to give back to her and make her feel special. 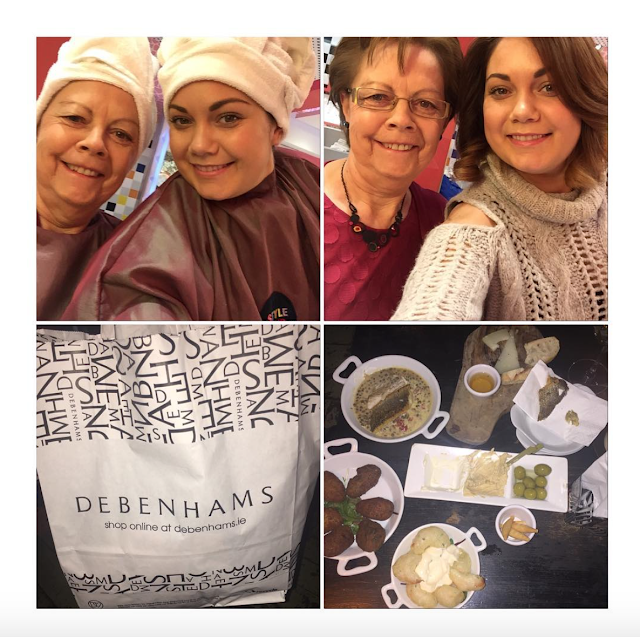 What better way to do that then spend the day getting our hair done, shopping and having a lovely meal. First stop on our day trip was at the Style club in North Earl street. We were treated to a fab wash and blow dry in the gorgeous salon. Next we headed to Debenhams where Mam picked up some fab pieces for her spring wardrobe. Last stop was a fab meal in the Port House in Temple bar. My Mam isn't that adventurous so she loved the idea of Tapas. It is the perfect date if you want a bit if everything to eat, I just love this restaurant. My Mam felt so spoilt and loved her day out. If you cant come up with what to do this Mother's Day why not pick up a OneforAll voucher like I did and take her on a day trip to remember. They have over 7000 retailers that accept the voucher so you day is never limited.